So often we have seen or heard the statement from police departments around the world that there has been a thorough investigation only to find out later through an inquiry the investigation was flawed . In the end we are dealing with human beings with all the same frailties, faults, positive + negative attributes as anyone else . It is not a badge and uniform that defines a person . Respect is earned and not given . Having a uniform or perceived senior position does not entitle anyone to instant respect or standing in the community . Like all of us you must earn it . Even being mindful that police in most part do a great job bungled investigations there have been .The initial investigation in regards to the Satin Man and the disappearance of the Beaumont children was one. 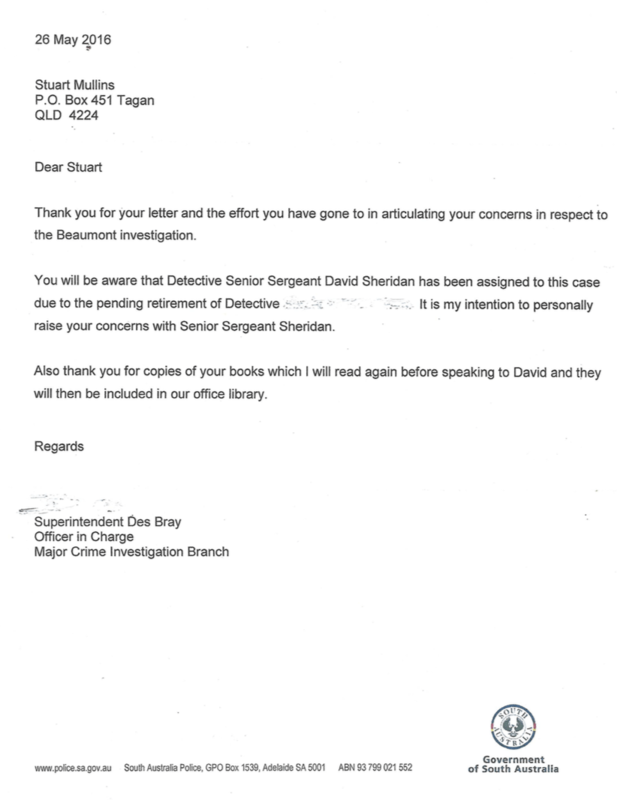 In regards to the many people mentioned in the Satin Man and so important to this case.They were never interviewed and met by SAPOL .Therefore it could not have possibly been a thorough investigation as stated many times by SAPOL Major Crime .With no clarification nor explanation of this comment. A couple that were managing an apartment block where Hayden Phipps resided in Surfers Paradise Queensland Australia. They found Haydn many times in a drunken state in the late evenings crying and spread out on the front lawn dressed in women’s clothing , bra , stockings with lipstick smeared on his face .On many occasions they found him in a depressed state and in tears . They strongly felt something was eating away at him but they were unsure what. 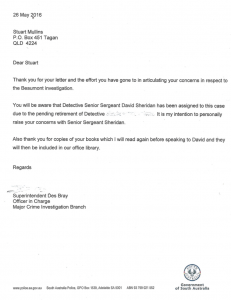 Haydn Phipps was never met and interviewed by Major Crime . Haydn has now passed away . Anglela Phipps Fyfe . Haydn’s ex wife was never met nor interviewed by Major Crime . Angela has now passed away . The lady that was raped/sodomised at the hands of Harry Phipps in the 1970s who reported this crime with a friend to the police. She was told by the police in the early 1980s it would be difficult to prove . They can take a statement but hard to prove. Steve P and his mate that took the satin garments from the Satin Mans attic in Glenelg and knew Harry Phipps second wife well have never been met nor interviewed . Gary L that also took satin garments out of the Satin Mans house and knew the wife of Harry Phipps very well indeed has never been met nor interviewed. YET Gary had some damning corroborated information regarding Harry Phipps and the second wife regarding his sexual deviancy . He has since had a stroke. Hadyn Phipps next door neighbour John C in the 1950s 1960s and early 70s knew the family well . He knew about and experienced on several occasions Harry Phipps handing out of pound notes . He described the Phipps family as completely dysfunctional . He has never been met , never interviewed . Norm L and his wife that worked as a barmen at an Adelaide South Terrace gentleman’s club in the 1970s . A club that Harry Phipps frequented attired in Satin dresses as with other like minded males . Norm was never spoken to nor interviewed. He passed away in mid 2017. A detective called him in late 2017 but was informed by his wife he had passed . Haydn Phipps closest male cousin Peter S . He had sent many letters and emails to Major Crime asking them why he has never been interviewed . Peter knew of Harry Phipps satin fetish and of Hadyn’s abuse at the hands of Harry and the handing out of pound notes and Harrys physical description. He has never been interviewed and never met . Arch Bishop John Hepworth who knew of Harry Phipps in pedophilic circles in the 1950s 1960s and 1970s has never been met nor interviewed in relation to his knowledge of Harry Phipps. Nicholas Phipps son of Haydn Phipps who knew his father was sexually abused. That described Harry as complete evil .He has never been interviewed and never met . NIcholas friends in the 80s who knew of the making of satin and not to go around to Harrys house on his days at home dress making and other ” Never interviewed , never met. The Strata Titled Apartment Managers Broadbeach Queensland where Haydn Phipps owned a beach side unit. They experienced first hand Haydn Phipps ” unusual behaviour ” over several years . They saw Haydn on several occasions sprawled out on the front lawn of the apartment late at night dressed in womens clothing. A bra on the outside ,wearing stockings. Lip stick smeared across is lips . Always in a drunken state sobbing . The managers both stated something was eating away at Haydn but they were unsure what . When sober Haydn after affection and would come down stairs to talk. BUT he was a troubled soul but they never knew why . They were never interviewed by the police /major crime . There are more all in the Satin Man book. In fact most people in the Satin Man book have never met and never interviewed …A thorough investigation ? It has not been . 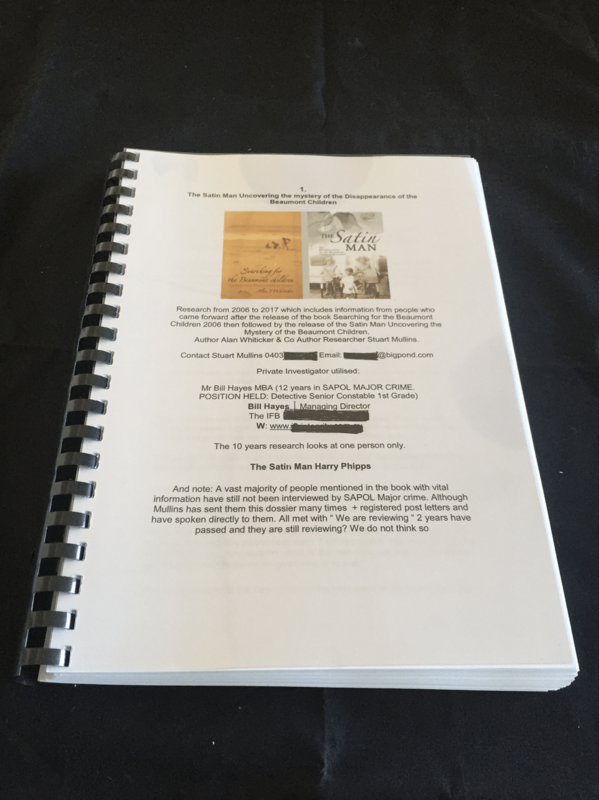 This dossier pictured above was put together by Stuart Mullins and was sent to Major Crime many times. With names , phone numbers and interviews carried out by Mullins and Hayes. 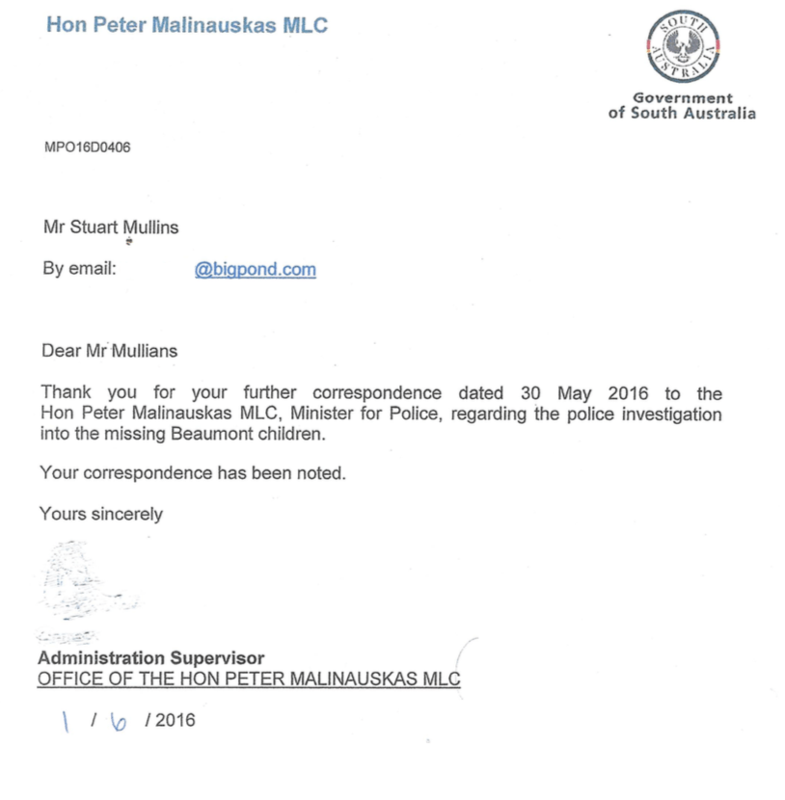 Not happy with the investigation Mullins wrote to the police minister. His reply is above . 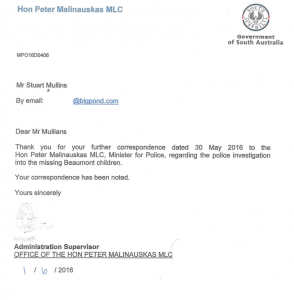 Major crimes letter to Mullins. In 2017 SAPOL with a new detectives on the case and working with Channel 7 Harry Phipps has been elevated to a person of interest by SAPOL Major Crime. Only six in the 52 year history of this case have reached that milestone . Harry Phipps is now one for good reason . With a bit of luck a complete impartial inquiry into the investigation and Harry Phipps is on many peoples wish list .The Beaumont story needs a full coronial inquest as something in this case is just not right. Those who say it cannot be done should not interrupt the ones who are doing it. 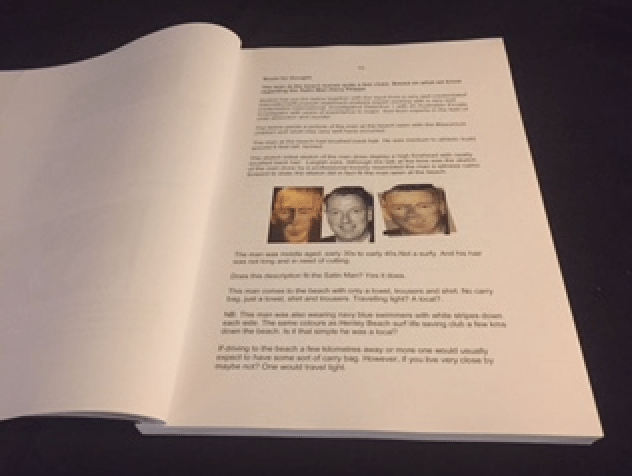 Page written and constructed by Stuart Mullins.